How much does it cost? : Some touristy things are worth the hype and this is one of them. One ride is $7 and you can pay in cash on the train. A day pass is $12 and you can download it from the Muni Mobile app on the app store. So if you’re planning on riding more than once throughout the day, download the pass. How often do they come? : Cars come every 10 minutes or so, but will often pass stops if they are too full. They leave every 10 minutes from the cable car turnarounds, which means you can be waiting at a turnaround for a while! They are not the fastest way to get anywhere in SF. Be prepared to spend some time that day waiting and don’t try to get on one 15 minutes before you’re supposed to be at your Alcatraz reservation. Where’s the best place to get on? 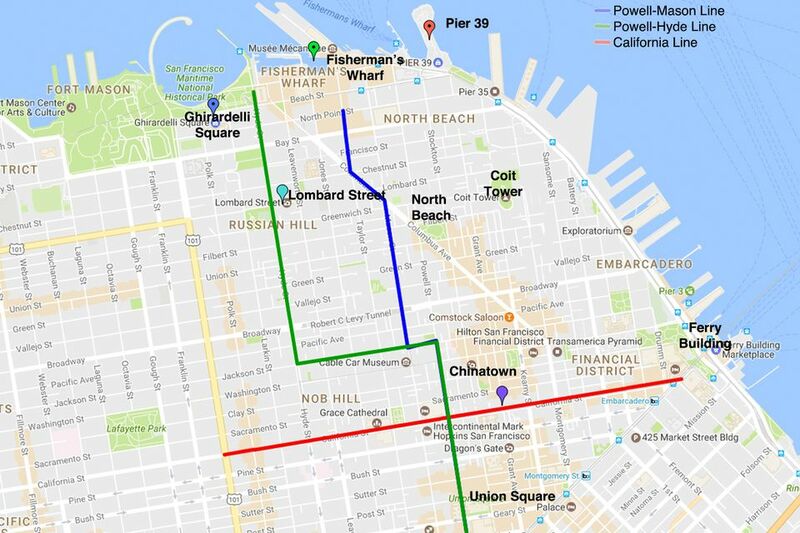 : Here’s the big trick to beating cable car lines: you can get on anywhere there’s a stop! That means you don’t have to stand in a long line at Union Square or Ghirardelli Square. My two favorite places to hop on are at 5 Embarcadero Center for the red line in the picture below. Transfer to the Powell Cable Car (Green Line) for an amazing scenic ride past Lombard Street ending at Ghirardelli Square. Once you get to Ghirardelli Square, you can attempt to beat the cable car line by walking up the tracks to the next loading point, though sometimes the line is still long there. The best option is to get back on near the Starbucks at 499 Bay Street about a 0.5 mi walk from Ghirardelli Square. There is rarely a line here. What else should I know when riding with kids? : The cars get going FAST around corners so make sure kids are holding on tightly should they choose to hang off. Strollers go in the back and will need to be folded up. Usually They run on Christmas! One of our favorite traditions is to ride the cable cars at Christmas and get Dim Sum in Chinatown. Christmas Day is rarely crowded and we’ve never had to wait in a line.